- We will provide the Internet Room (free Internet access point) on the 1st floor of the hall. - We will prepare 10/100Base-T Ethernet cables and equipment for 802.11b wireless access. - We will NOT prepare PCs. Please bring your own PC. Nara, a beautiful ancient city of World Heritage, is located about 35 km east of Osaka and south of Kyoto. Nara is a city of cultural and historical importance in Japan, having been the capital of the country in 710-784 A.D. There are numerous temples, shrines, statues, carvings and paintings, many of which are well-preserved and designated as important cultural assets and national treasures. 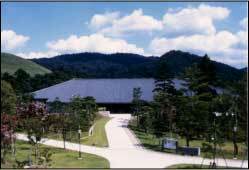 Nara-ken New Public Hall is situated in Nara Park, where you can also find famous historical buildings such as Todai-ji Temple, Koufuku-ji Temple, and Kasuga Grand Shrine. Nara Park is also famous for it's thousands of tame deer that roam freely. The most convenient way from abroad is to take a direct flight to the Kansai International Airport (KIX). From there, the simplest route to Nara is by the Airport Limousine Bus, which takes approximately 85 minutes to arrive at Nara Station (Kintetsu and JR lines). This costs 1,800 yen one way, per person. Buses depart from stop No.9 and scheduled to depart approximately once every 60 minutes. Should there be any inquiries regarding access to Nara, please ask at the Information Desk at the airport on the first floor in front of the arrivals area. You can take Airport Limousine Bus from / for Kansai International Airport (KIX) and Osaka (Itami) Airport. You do not need to reserve a seat for service from Kansai and Osaka Airport. - Please take a bus for "Nara". - Time required : About 85 minutes. - Fare : Adult 1,800 yen / Child 900 yen. - Please take a bus for "Nara / Tenri ". - Airport limousine bus leaves South terminal and goes in every bus stop via North terminal. - Time required : About 60 minutes. - Fare: Adult 1,440 yen / Child 720 yen.